The Ewa-Marine VXA housing is designed to fit the Canon XHA1 and XHG1 camcorders. It is manufactured from double-laminated PVC with an optical-glass port, and is rated for dives to a depth of up to 33' 10 m). This housing is perfect for snorkeling, shallow diving, sandy, dusty, humidity, or foul weather conditions. It will give your camera the best possible protection while still being fully operable. It has a pair of non-corrosive and seawater-resistant clamping rails which fit together to seal the housing. They tighten by means of three screw knobs. Other camcorders that are smaller than 15.35 x 4.72" (39 x 12 cm) length x width with a 75mm lens will also fit in this housing. Housings manufactured from double laminated PVC and have an optical-glass port. Depth rated to 33' (10 m). Has a pair of non-corrosive and seawater resistant clamping rails which fit together for a perfect seal. They tighten by means of knurled thumb screw knobs. 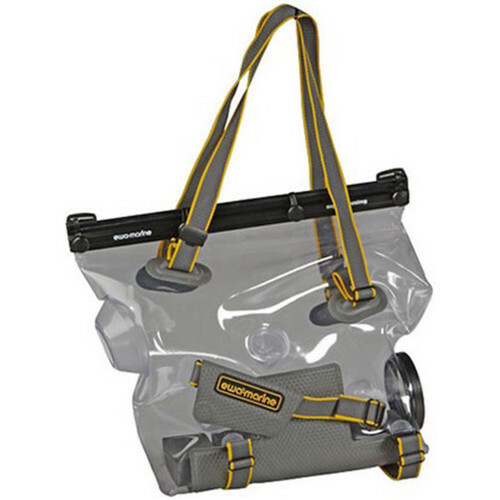 Perfect for snorkeling or shallow diving, sandy, dusty, humid or foul weather conditions. Supplied in a handy yellow carry-case with has a water-proof interior and zippered side-pocket. Box Dimensions (LxWxH) 16.8 x 11.5 x 4.7"
VXA Underwater Housing is rated 3.0 out of 5 by 2. Rated 1 out of 5 by Jason from Nice bag but extremely over-priced. I bought this for my cameras and when I received it and took it out of its box I simply had to say to myself, This is what I get for $?? I tried to validate it in some way, after all video gear is expensive and I am used to that and willing to pay for a good product. But this is nothing more than a specialized plastic/PVC bag with a couple metal clamps and a photo quality lens cover. I just could not believe I was asked to pay this for such a product. I would say that its Fair Market Value should be no more than $250. After all it is a bag that can be damaged, punctured, etc. I have since found actual housings that are half the cost and made of much better material and much easier to control.I have written EWA Marine to let them know that I am returning their product because of pricing alone.I am certainly not mad or upset in anyway, and this had nothing to do with BH photo, but I felt the need to let others be aware of this. I am going to look into an Epic Pro HD housing.This is by no means a knock on BH Photo. They have a great store and great service. Rated 5 out of 5 by RWHITE ACE from Works Like it said! Try it right out of the box and it worked perfectly Great if your on a tight budget and need a underwater housing Great Buy!